This poem (unfortunately) was based upon a real event. It struck me (as I tried to avoid looking at the nasty slice) that there was some potential to view this metaphorically, and – after about four pages of notes – I was able to unpack some of the ways I thought this event was significant to me in a larger context, and then pick out those elements that I thought might resonate with others, and which seemed to “hang” together in regards to content, structure and tone. This is pretty common for me, almost like building up your own block of granite, and then chipping away at this to create the final form. I typically type out drafts directly online. I can see how others might feel that it’s helpful to have the physical connection to their words that pen/pencil and paper affords, but I find that seeing my own words all dressed up in their final fonts, spacing, etc. allows me to keep some objectivity and distance from what I’m writing, and helps me know when my words are ready (or not) to be set loose and make their way in the wider world. Additionally, storing everything online allows me to keep drafts safe and secure, and to work on them using any computer, and to use my cell phone as a notepad. 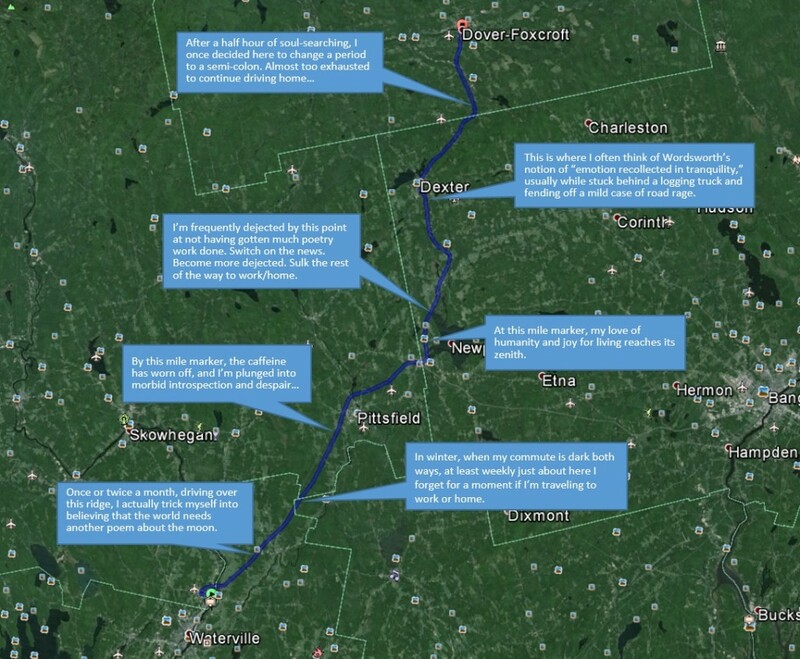 The map above shows my hour-long commute through a somewhat rural section of Maine, with comments to help describe how the writing process is typically threaded throughout an average week’s drive to and from work. Before I ever write a word, I’ll frequently spend some time considering a topic or theme in my fairly long work commute (which was the case with this poem). I also use this time to work on individual words and phrases, often repeating variations of the same line over and over to find the best music in it, taking advantage of my seclusion to prevent people from thinking I’m a complete lunatic while I’m doing this. Because my memory is so poor, focusing only on the very large, structural part of writing, as well as this very detailed level usually ensures that nothing’s forgotten before I arrive at my destination.